﻿ Inconel reinforced Graphite packing (with corrosion inhibitor) - China Inconel reinforced Graphite packing (with corrosion inhibitor) Supplier,Factory - Cixi Aiflon Sealing Materials Co.,Ltd. Braided from low-sulphur expanded graphite yarns, reinforced with Inconel wire. It retains all the inherent benefits of 2000 pure graphite packing, good thermal and chemical resistance, very low friction, the wire reinforcement also provides greater mechanical strength. Other metal materials, nickel, stainless steel etc. on request. 2000I & 2000IK is a multi-service packing capable of a wide variety of uses throughout a plant. It is particularly suited for use in high temperature, high pressure steam service. In addition, it can also handle most chemicals, acids and alkalis. Style 2000I and 2000IK is excellent for use in steam turbines, high temperature motor-actuated valves and for high temperature and high pressure valve applications in general. 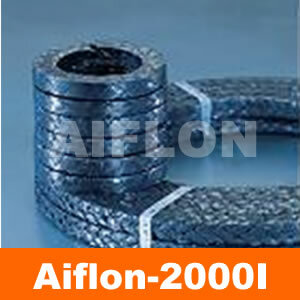 Recommendation: May use with Aiflon 2102 high carbon fiber anti-extrusion packing rings. in coils of 2 to 5 kg, other package on request.